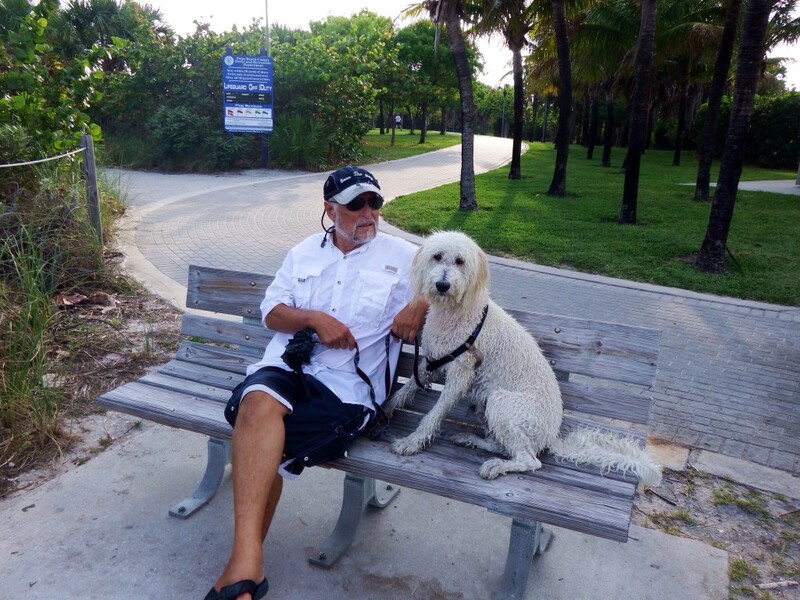 We arrived in Lake Worth from Bimini on the Saturday of Memorial Day Weekend and were not looking forward to the speeding boaters in the ICW on one side of Lake Worth and in the channel next to the anchorage on the other side. However being able to go to nearby Peanut Island is worth the time spent in the rocking anchorage. 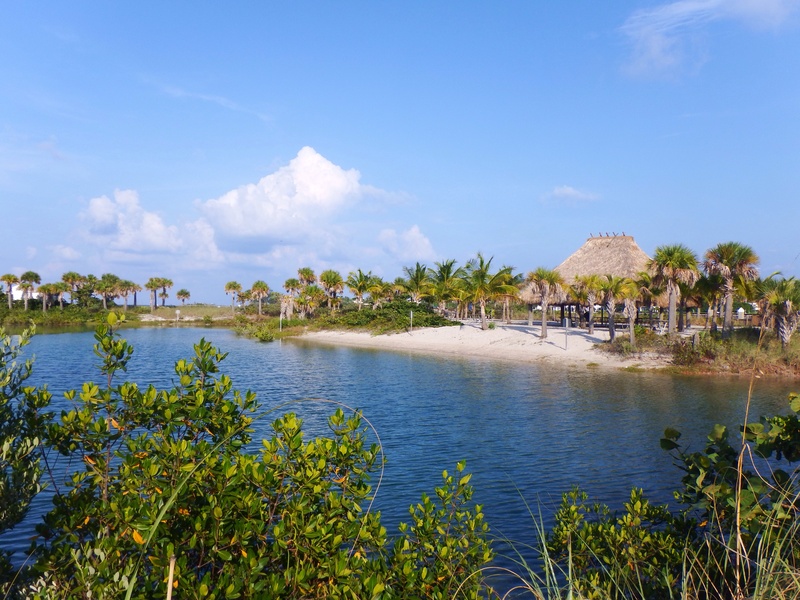 The island is a fantastic park with a paved walkway that winds through palm trees and other vegetation. It is a very popular area for the locals to come to on weekends and holidays, with Memorial Day Weekend being particularly crowded. 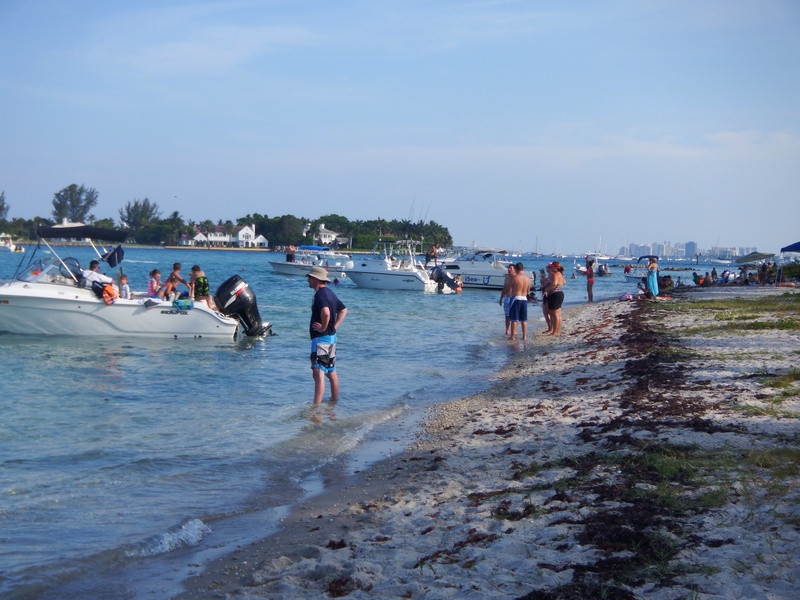 Many visitors come by small boats and water taxis bring people to the island from Riviera Beach or Palm Beach. 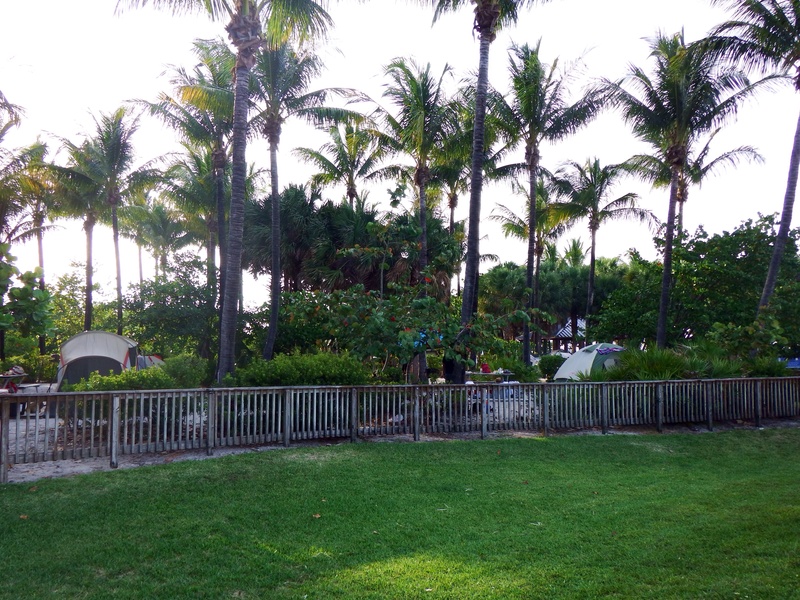 There is a tent campsite and numerous covered picnic areas as well as areas to swim and snorkel. 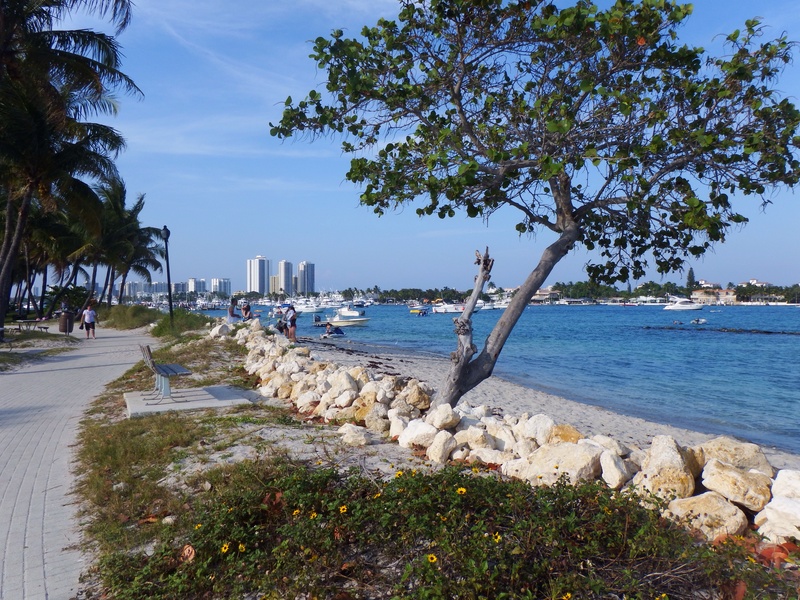 Palm Beach is home to large estates with ocean beaches on the east side and Lake Worth on the west side. 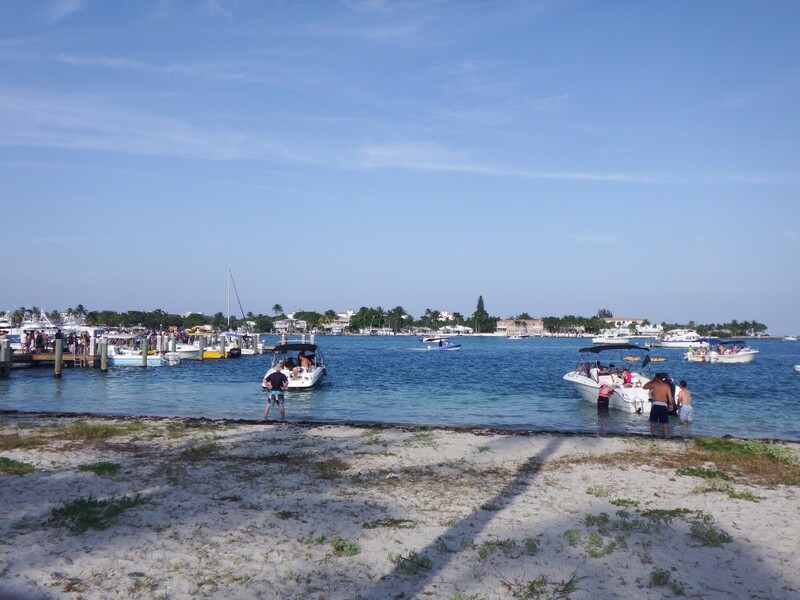 The Lake Worth inlet is a popular one for cruisers to leave from to go to the Bahamas and to return to at the end of their trip. 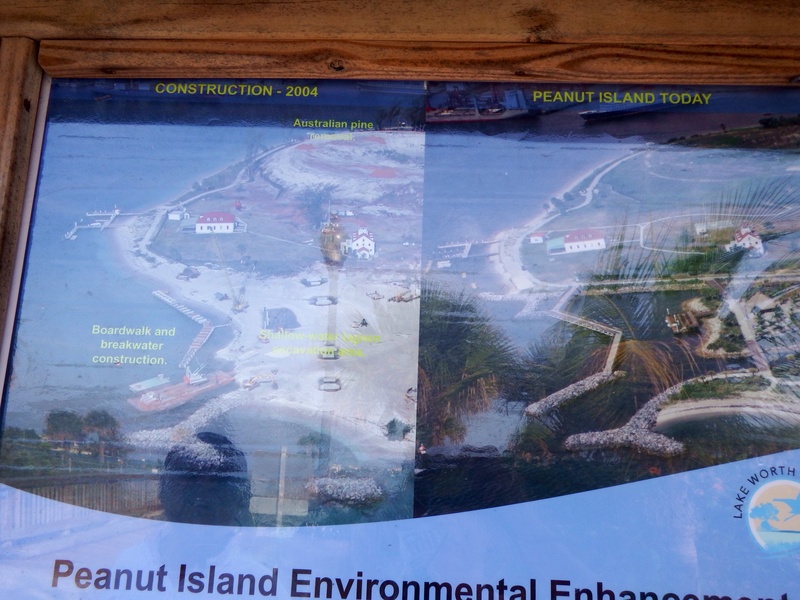 Peanut Island is located just inside the inlet. The western shore of Lake Worth near the anchorage we are in is mostly industrial. After anchoring near the inlet, we took the dinghy to Peanut Island and on the way passed a large wooden vessel at a dock in front of one of the houses where a party was taking place. A closer look revealed she was the yacht used by five presidents. 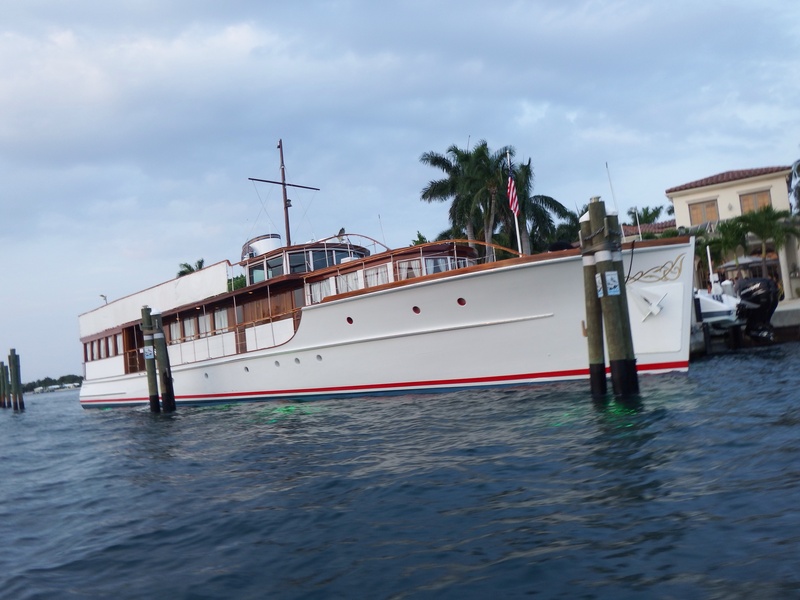 John Fitzgerald Kennedy spent the Christmas and Easter holidays on this yacht and in his Palm Beach home. During the summer months she was docked in Cape Cod. Each president could change the name of the yacht and Kennedy christened her Honey Fitz, after his maternal grandfather Boston mayor John Francis Fitzgerald, whose nickname was Honey Fitz. The yacht is now privately owned and can be chartered, renting for $5000 for four hours. She is docked at a marina in West Palm Beach, but retains her home port as Washington DC. There is a presidential seal on the smokestack and the Honey Fitz is decorated with memorabilia from the five presidents who used the yacht. It’s worth a Google search to find out more about her fascinating history. The Kennedy family had a vacation home in Palm Beach purchased by JFK’s father in 1933. During the 1960’s it became the winter White House. 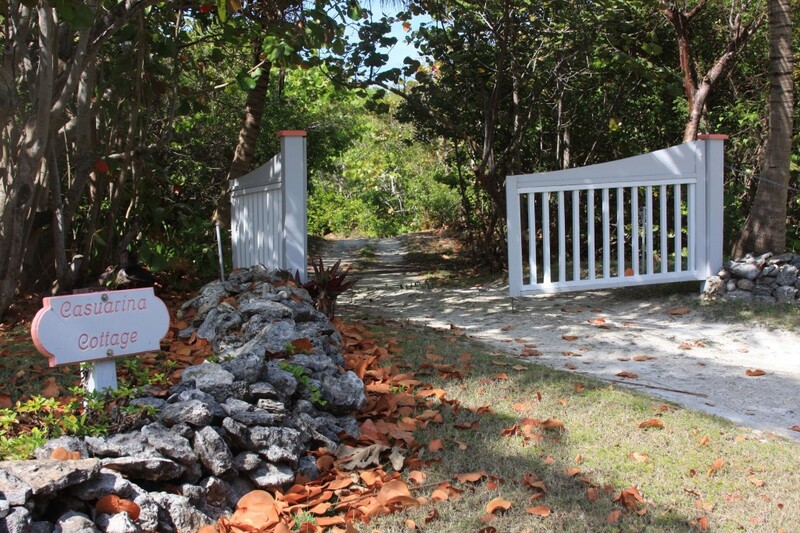 A bunker was built on Peanut Island as a fallout shelter for Kennedy shortly before the Cuban Missile Crisis. 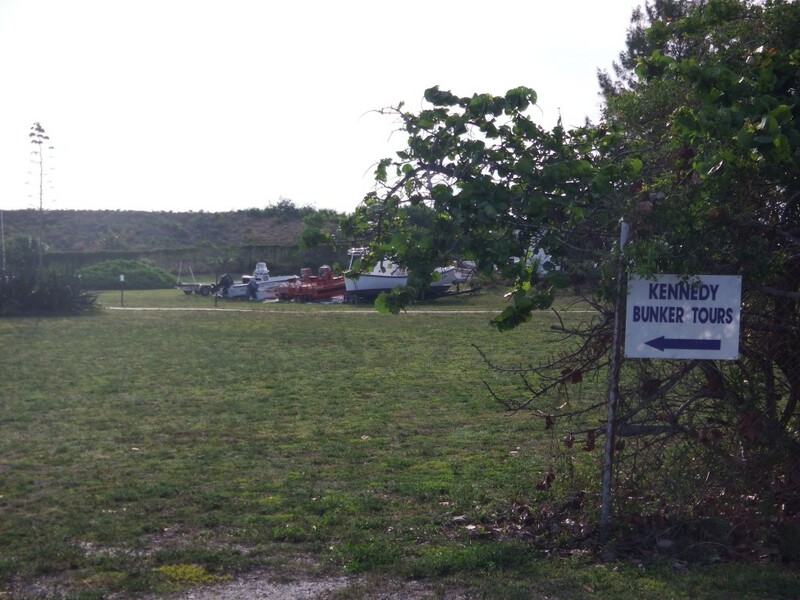 The Kennedy bunker is now open for public tours. 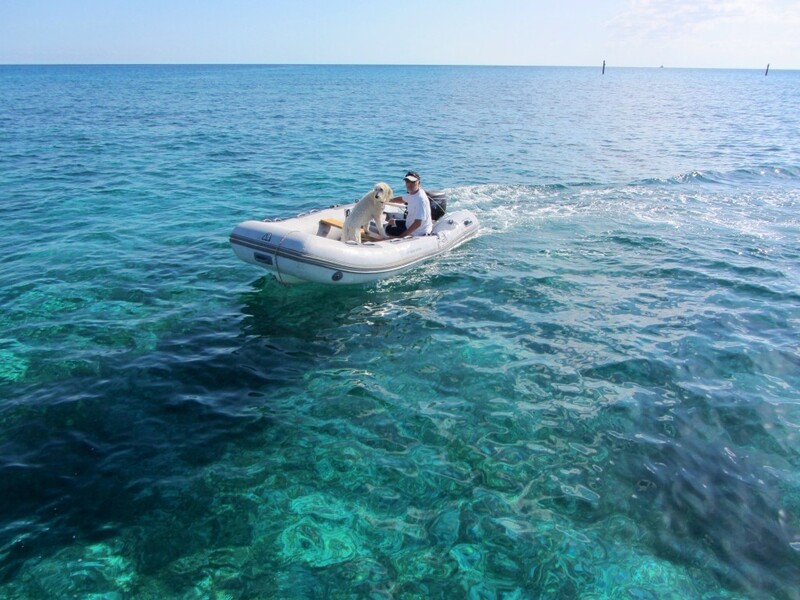 When we were in the Bahamas, we met a couple who live on Lake Worth next to the anchorage we are presently in and were cruising in the Bahamas in their yacht. They told us about the bunker and the local rumor that it was used by Kennedy one time, when he took Marilyn Monroe there! Three feral cats live on Peanut Island now and are named Jack, Jackie, and Marilyn. 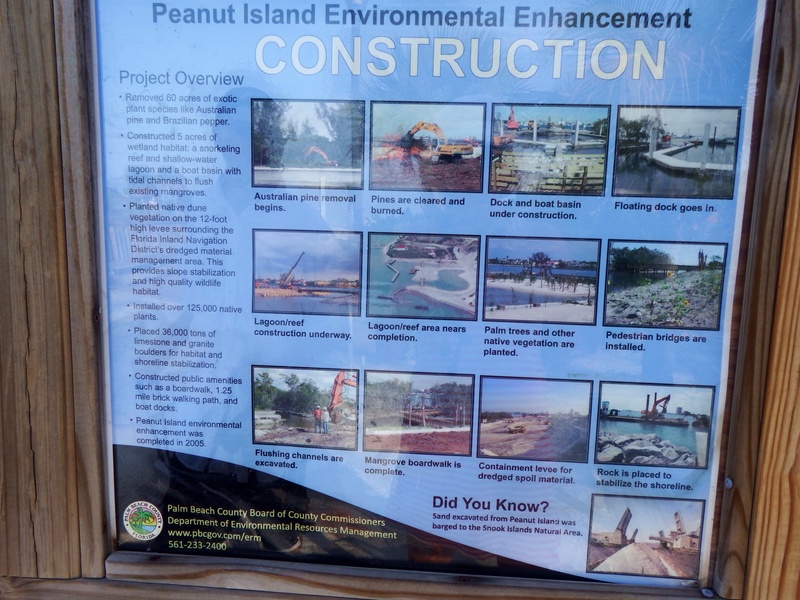 Here are more pictures of our visit to Peanut Island. 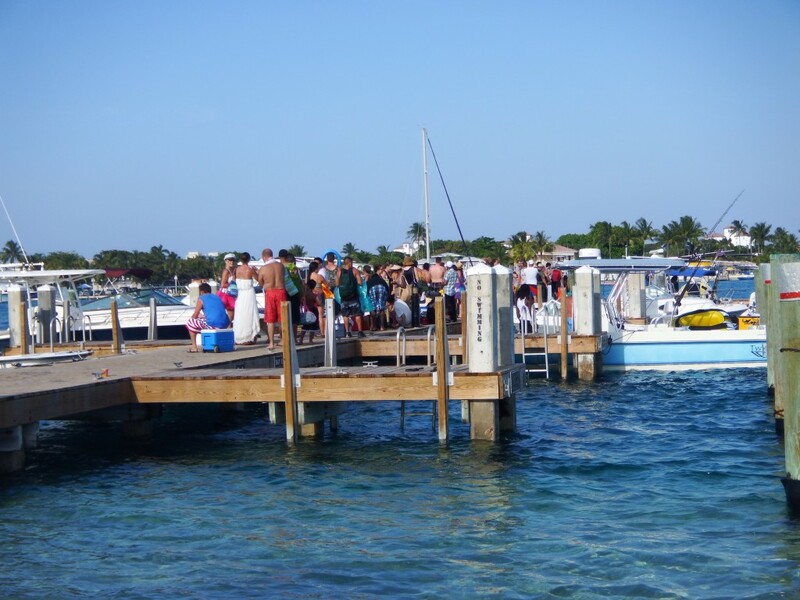 Visitors line up on the dock to take water taxis back to Palm Beach or Riviera Beach. 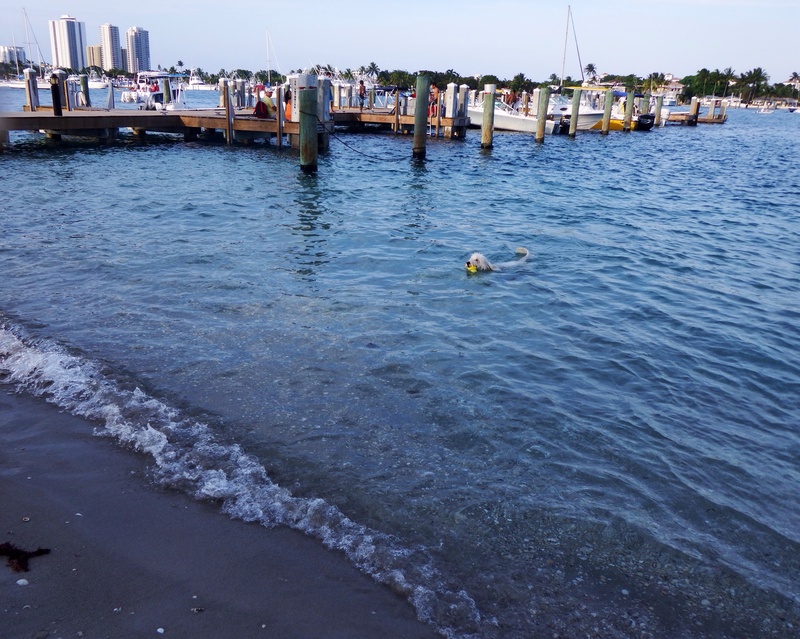 The docks are free to use during the daytime and small boats can also anchor near the shore or pull up on to the beaches, except the ones designated as swimming areas. The wide walkways and bridges run along the shore and weave through the interior of the small island. This is the bunker built for President John F. Kennedy. The entrance is through a small tunnel. I suspect that reservations for this tent campground are made at least a year in advance for Memorial Day Weekend. It was full all weekend, but completely empty by Monday afternoon. There are numerous places to snorkel around the island. 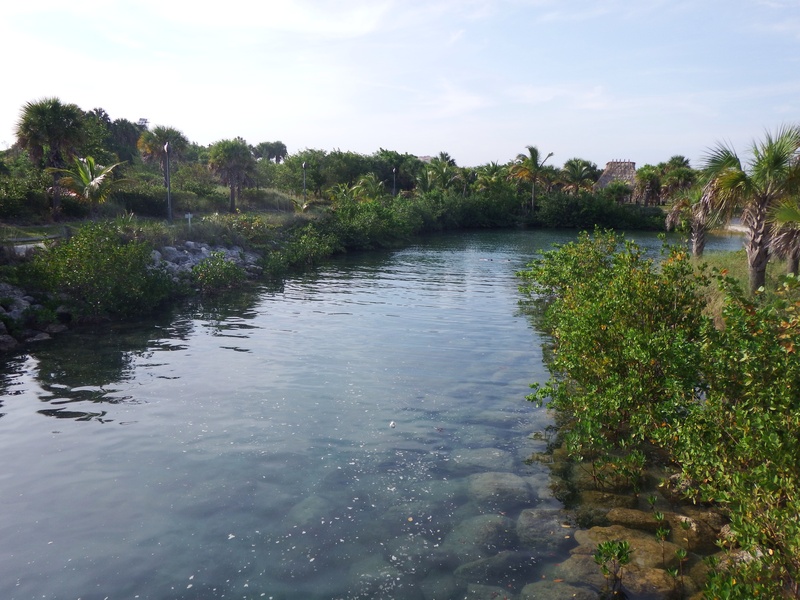 During the construction process, reefs were added where many varieties of fish can be seen in the crystal clear water. 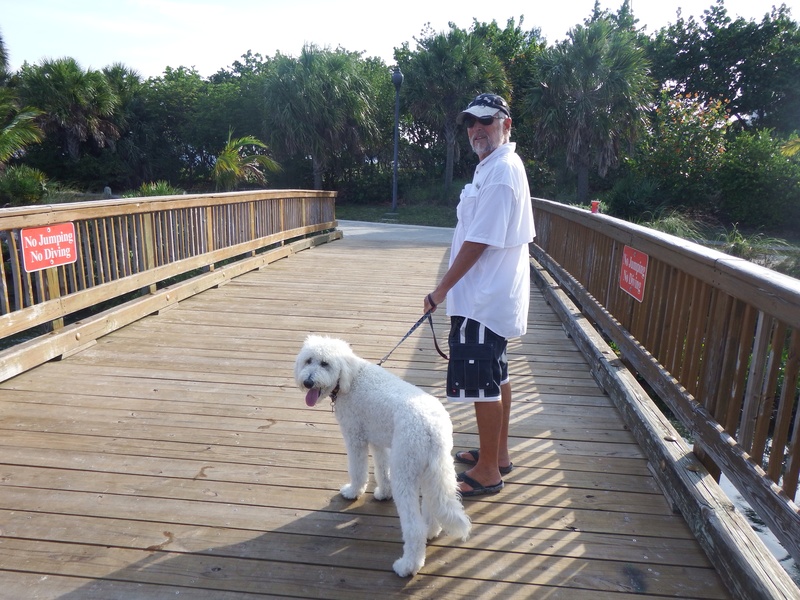 Peanut Island is very dog friendly. 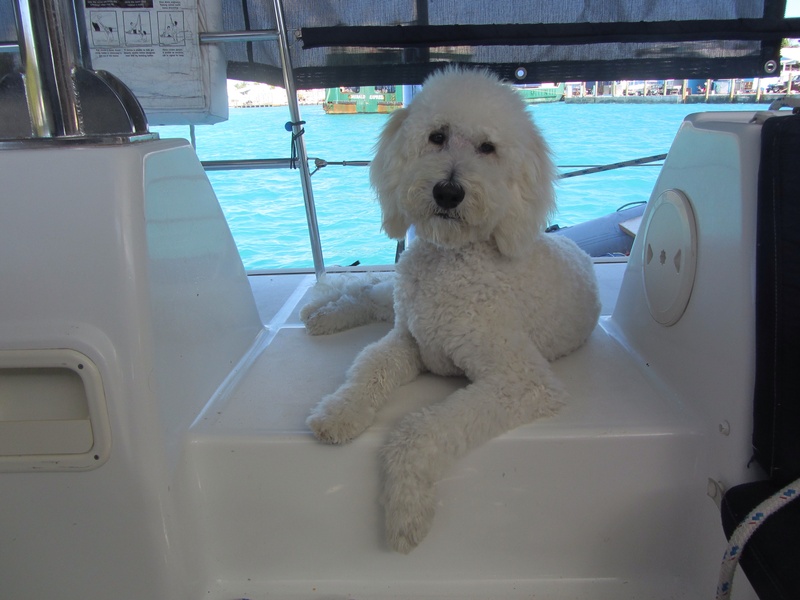 When we stopped here on our way to the Bahamas in early March, Sailor was afraid to go in the water by the docks. 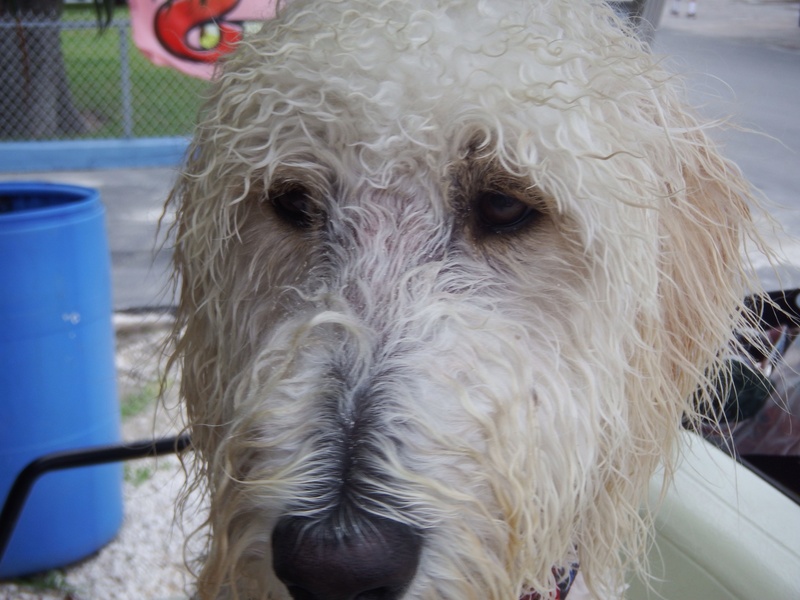 He had never been swimming and ran into the water without realizing it was wet! Realizing his mistake, he raced to get back to solid land. This time, he enthusiastically fetched his wubba. 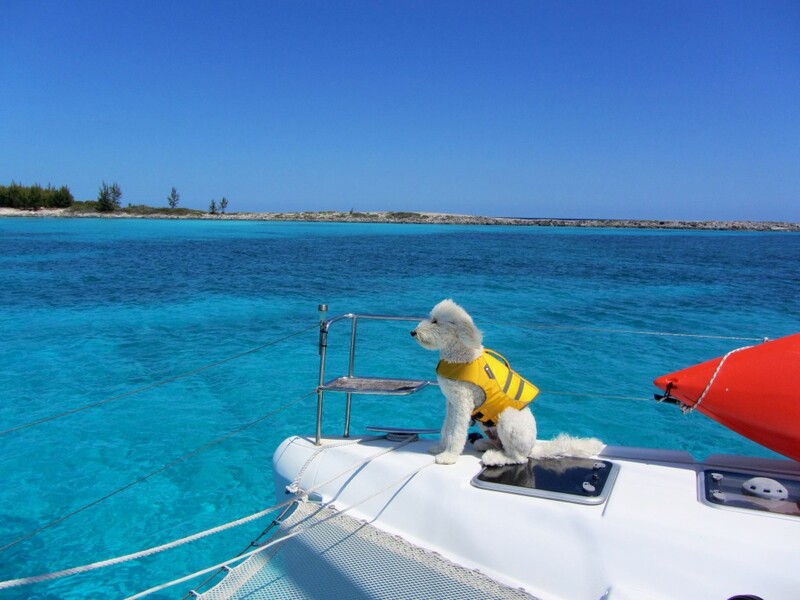 He learned to love the water during his three months playing on many beaches in the Bahamas. This is one of the covered picnic areas which are placed throughout the park. 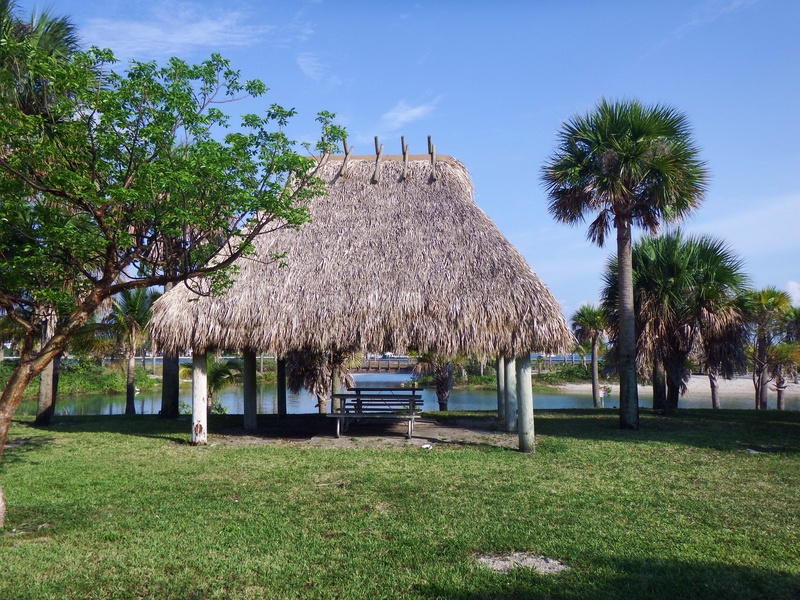 The pond where Sailor swam and the tiki hut picnic area were empty every time we went to Peanut Island. There are several other beaches on the lake shore of the island which have lifeguard towers and were crowded with swimmers. 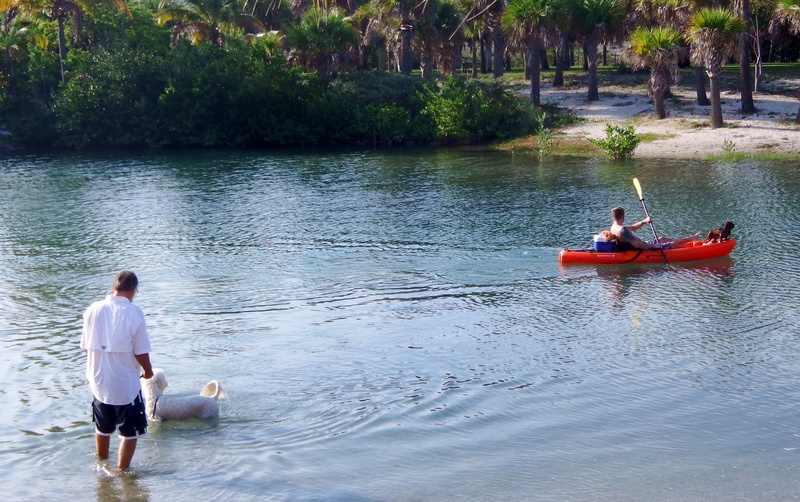 While Sailor was in the water, a kayaker paddled by with his dog on the front. They noticed each other but wisely did not try to get together. 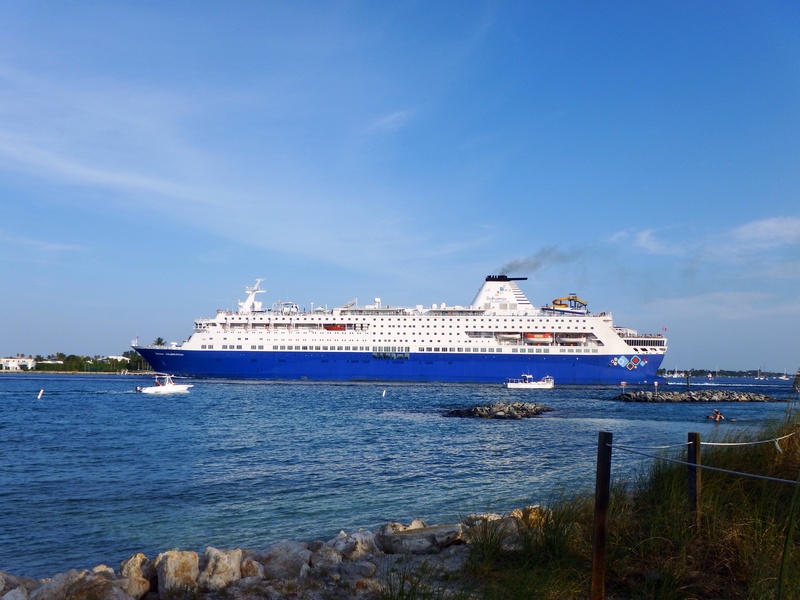 After walking and swimming, it was time to rest on a bench and watch the busy boat traffic go by, including the Bahamas Celebration Cruise Ship which was leaving the Lake Worth Inlet for a two night cruise to the Bahamas. We are staying in Lake Worth through Tuesday, when we will raise our anchor and go the short distance across the lake to Cracker Boy Boatyard where Nance and Underwood Riggers will remove our sails, unstep the mast, and bring them to Ft. Lauderdale to store until we have them put back on again at the end of hurricane season in November. On Wednesday we will take the final leg of our 2014 cruise back to Sunset Bay Marina in Stuart, FL. This entry was posted in 2013 - 2014 Bahamas Cruise, Beach, Florida and tagged Lake Worth, Peanut Island on May 27, 2014 by Jan.
We’ve been in Spanish Wells, Bahamas for three weeks and until a few days ago the weather has been great, very windy but mostly sunny and always right around 82 degrees in the day dropping to the high 70’s at night. The mooring field is protected on all sides and the water is almost always calm even with high wind speeds. We haven’t experienced thunderstorms or even much rain since we arrived in the Bahamas in early March, but this week has made up for it. 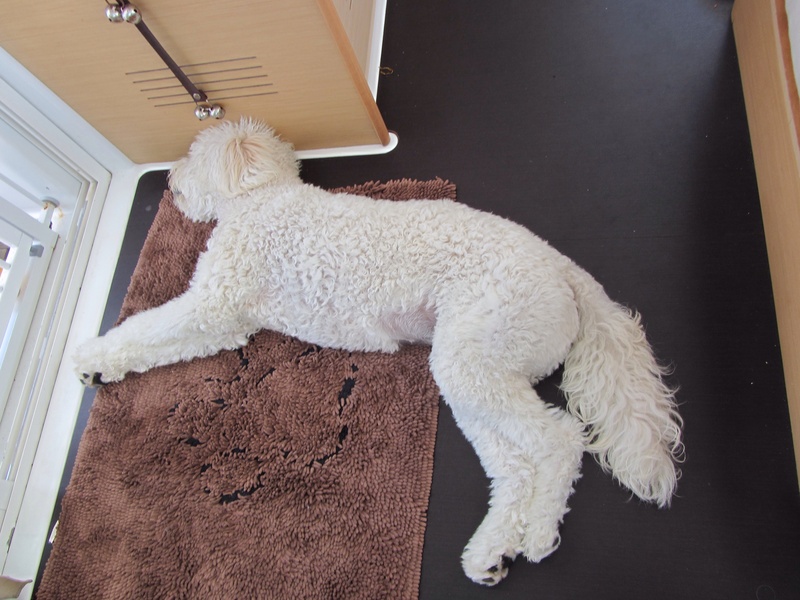 The photo above was taken this morning at about 0700 when Sailor went up on the forward deck as he does every morning, checking to see if anything happened while he was sleeping. Being the smart dog he is, I suspect the gray skies did not make him happy, realizing he might not get to fetch his Kong Wubba on the beach today. An hour later, he was inside and this was the view out of the same salon window. The lightning accompanying thunderstorms is usually a concern when you have a mast sticking up over 60 feet from the water. However, we are hopeful that there are more inviting targets in the harbor, especially the many large lobster and shrimp fishing vessels on the docks with their tall metal outriggers. After awhile you just can’t worry about lightning because it’s out of your control. The concern for us with these storms is that Sailor has suddenly become afraid of thunder. Never having a dog with this fear before, I looked to Google for answers and it didn’t disappoint me with lots of links for this subject. Of course, one’s first reaction is to comfort a frightened dog, but I read this is not a good idea. Apparently it simply reinforces the fear, so instead we should continue whatever we are doing and not make a big deal out of Sailor’s reaction. 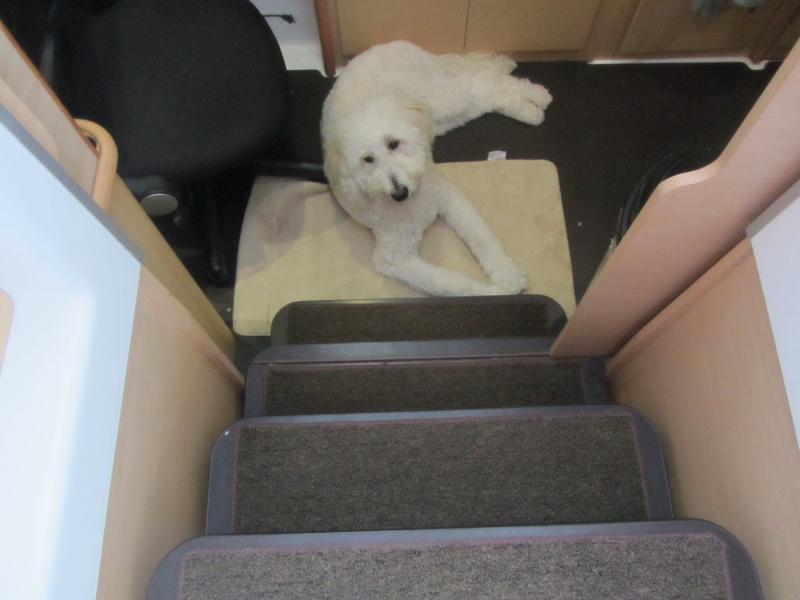 When Sailor hears the first “boom” he runs down the four steps to the master companionway, sometimes going into the bathroom or jumping on the bed to get as far away from the thunder as possible. He’s worried, but not shaking, panting, or in distress, therefore it’s not too difficult to ignore the behavior. I read on a site that one theory is the static electricity in the air from lightning might affect some dogs and they go to a bathroom where the pipes disperse the charge. I also know that dogs can hear or sense thunder long before humans do, although Sailor doesn’t panic until the noise starts. I found two items in his first aid kit designed to calm pets, Rescue Remedy and Dog Appeasing Pheromone. These were purchased for our last dog Daisy to help her relax on long car rides, but unfortunately they have expired. A definite purchase when we get back to the States will be a Thundershirt although our hope is to work on getting Sailor to ignore the thunder, since it appears the longer the fear persists, the harder it will be to eliminate. The high winds and now the thunderstorms have delayed many cruisers who planned to be back in the States by now, or perhaps wanted to move on to the next island. 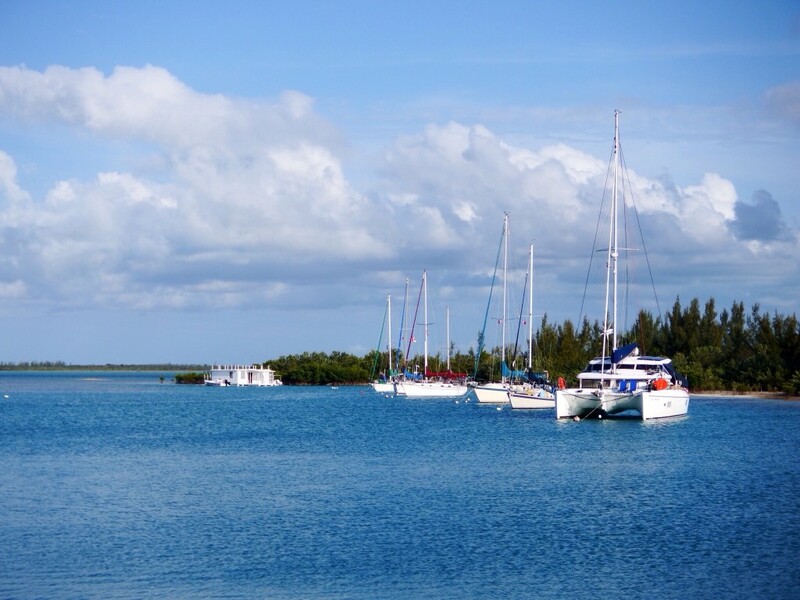 Spanish Wells is a jumping off point to go to the Abacos, which is about 60 miles away. 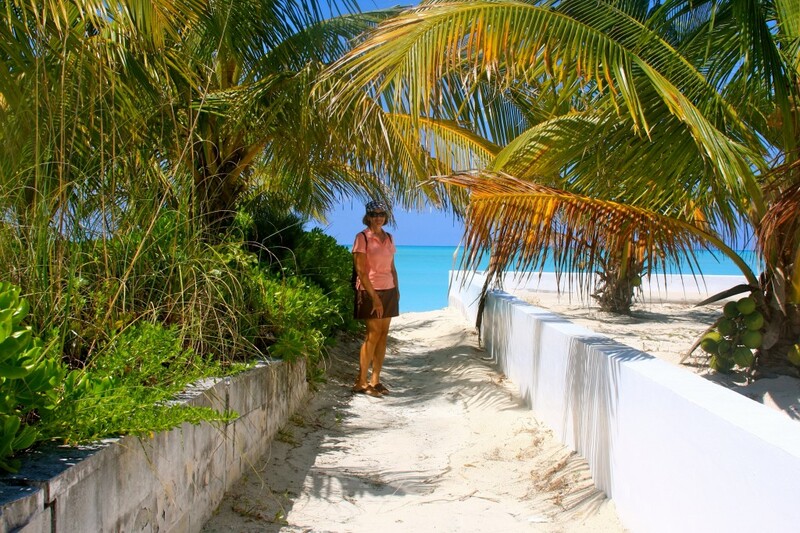 Many cruisers spend the first part of their Bahamas trip in the Exumas and points south, come back north through Eleuthera to Spanish Wells and go to the Abacos before heading back to the US East Coast. As we get closer to June 1 when we have to be back in Florida for hurricane season, we have started listening to Chris Parker’s Bahamas weather forecast webcast at 0630 again. (We can also listen to him on our SSB receiver, but the iPad and computer reception is much clearer.) As of now, the weather appears to be favorable for motorsailing back to Florida next weekend. There will be little wind, so true sailors won’t like it, but we will because that also means calmer seas. From here we’ll go to Chub Cay in the Berries, then on to Bimini, and the following day back to Lake Worth/Palm Beach. We’ll be getting the mast taken down there, part of our “hurricane plan,” and then we’ll return to Sunset Bay Marina in Stuart, FL for the summer and fall. Unfortunately, this time table corresponds with Memorial Day Weekend, so it might be dificult to get a marina slip in Bimini where anchoring isn’t good and powerboats could be coming from Florida for the holiday. Once in Florida I’m sure the waterways will be busy. “Busy” translates to lots of motorboats speeding around with their wake wildly rocking the anchored or moving cruising boats, i.e. rude South Florida boaters. Lake Worth, however, is less crazy on the water than Miami and Ft. Lauderdale so it shouldn’t be too uncomfortable. We will probably have to anchor there a few days waiting to get into Cracker Boy Boatyard for the mast unstepping. In the meantime, today looks like a good day to read and relax on the boat. If things get boring we can always watch what is motoring past us in the harbor. This morning before the rain started, MV Legend II, a 200+ ft long commercial vessel, used the mooring field for her turning basin. Looking at the photo at the beginning of this blog entry of Sailor gazing across the narrow harbor, this is exactly where Legend stopped while moving east, then rotated until perpendicular with her aft close to the dock where the pink house is and her bow between us and a St. Francis catamaran on ball 8. Then she continued to spin around to face west and pulled up to a dock to unload supplies. When ready to leave, Legend was pointed in the right direction to go through the same channel she entered from earlier. 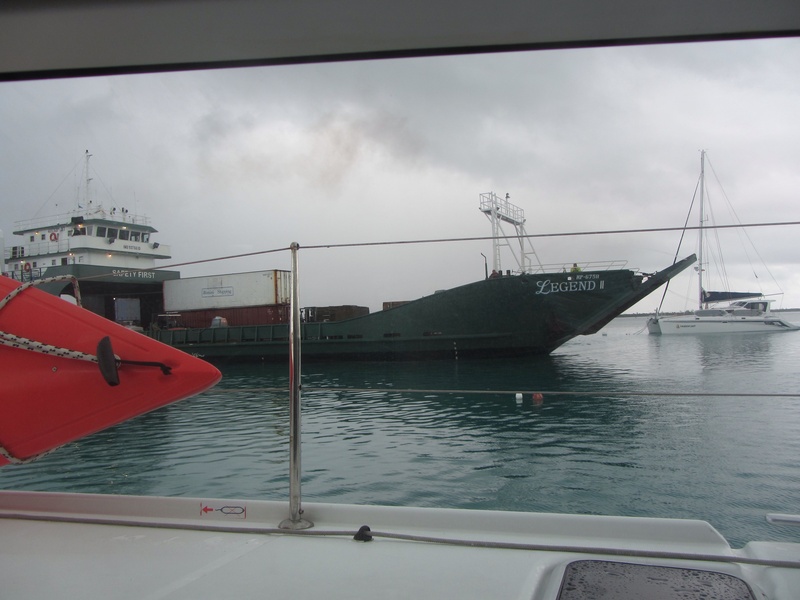 These large vessels do this regularly when they bring shipments into the Spanish Wells port. It’s amazing how expertly they are maneuvered to turn around in such a small space. 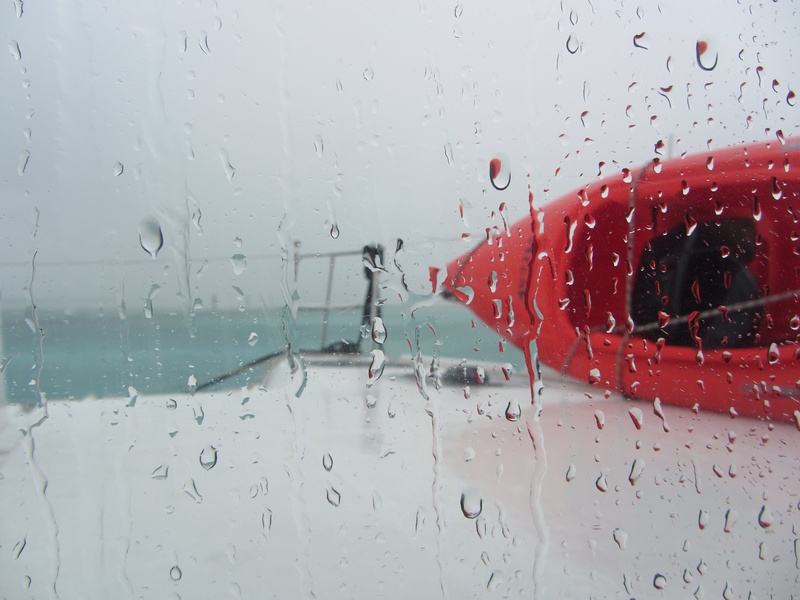 Later today, the rain did stop and we were able to go ashore. Sailor got to go to the beach where he fetched his Wubba in the water and then ran and ran, expending lots of saved up energy. We shopped at Kathy’s Bakery for homemade bread and, of course, made our regular stop for a frappuccino, aka iced coffee. 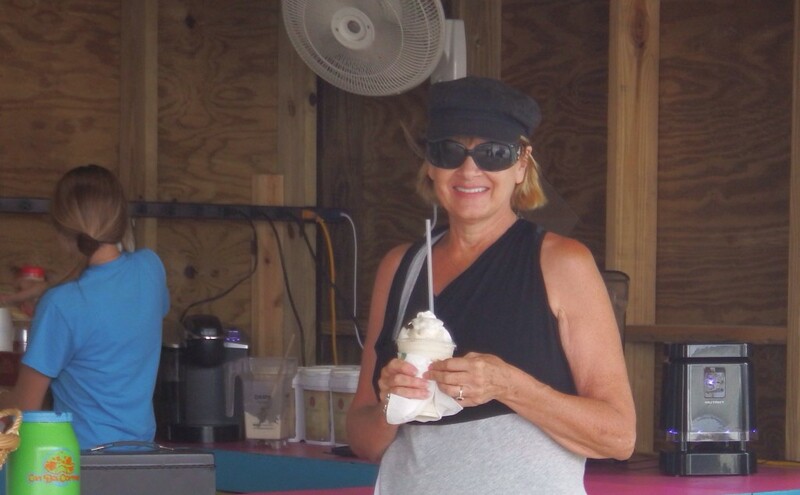 This entry was posted in 2013 - 2014 Bahamas Cruise, Spanish Wells and tagged Sailor, Thunderstorm, Weather on May 17, 2014 by Jan. 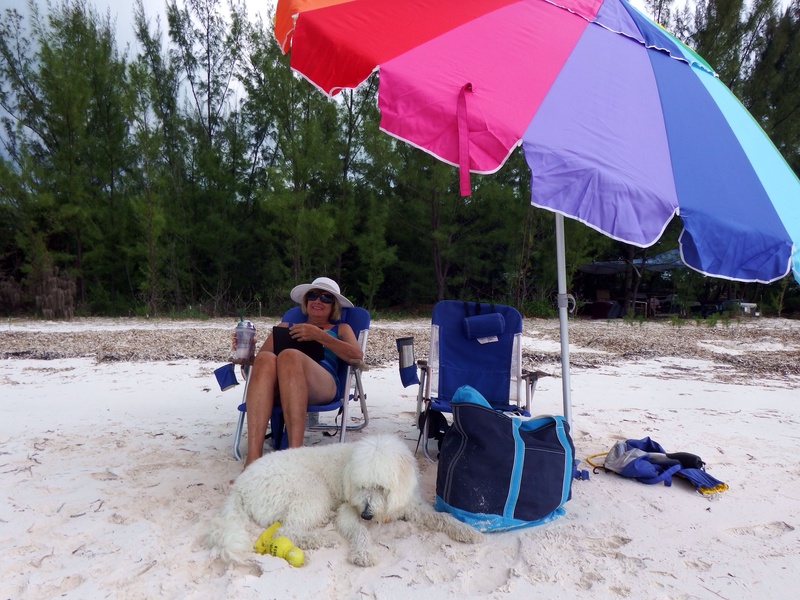 While we love the simple life of being anchored next to a small Bahamian island with deserted sandy beaches, after awhile we do miss some of the creature comforts and conveniences we enjoy in the States. That’s just one reason we are in Spanish Wells for at least three weeks before we return to Florida. 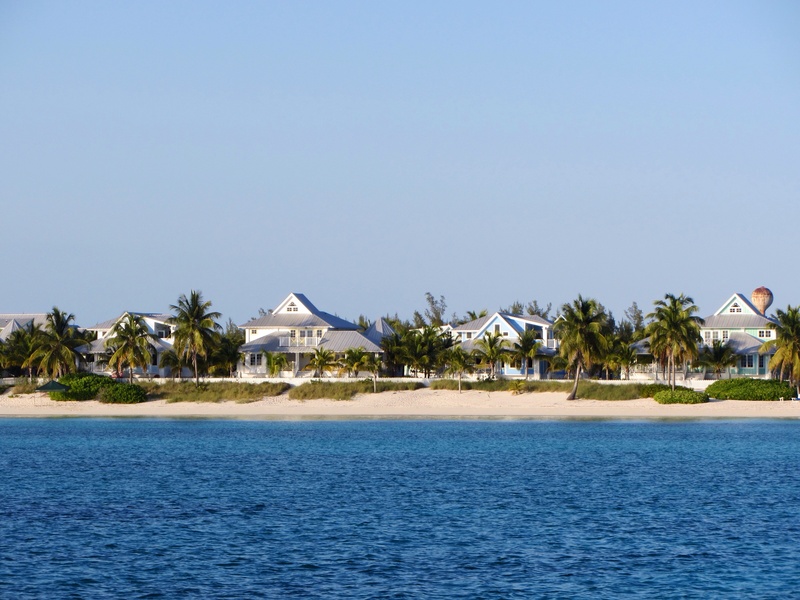 Located northwest of Eleuthera and south of the Abacos, Spanish Wells, the only town on St. George’s Cay, and its neighbor Russell Island have a combined population of about 1600. They are connected by a short narrow bridge. The people are mostly white native Bahamians, descendants of British who came in the 1600’s and Loyalists from the 1700’s. 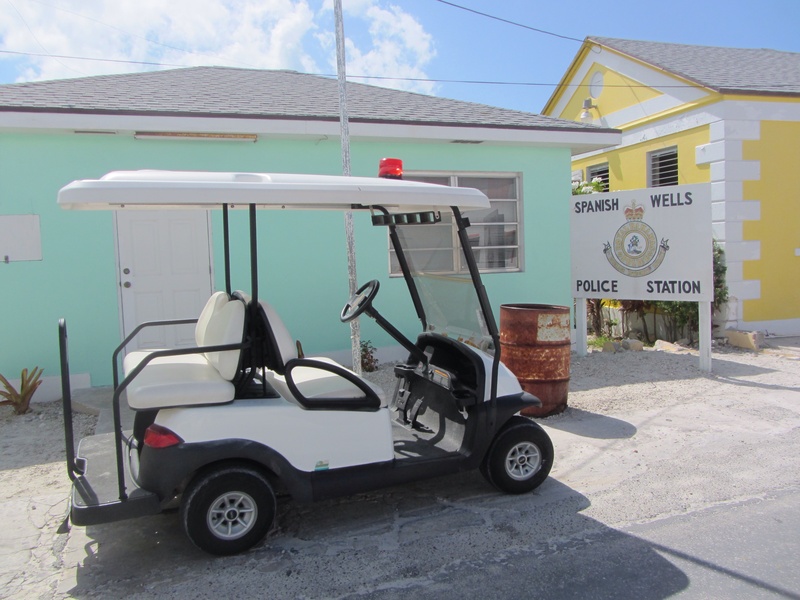 Spanish Wells is very different from the towns we visit in the Exumas. 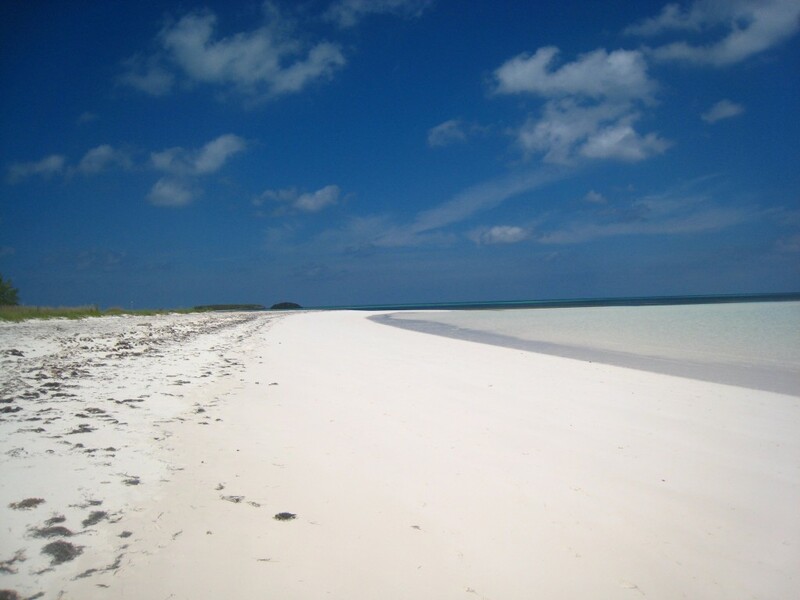 Most of the islands in the Exumas are sparsely populated and have very few onshore facilities. Spanish Wells is a much more developed town. The main business is fishing and the large fleet of fishing boats here provide shrimp and lobster for Red Lobster as well as many other outlets. 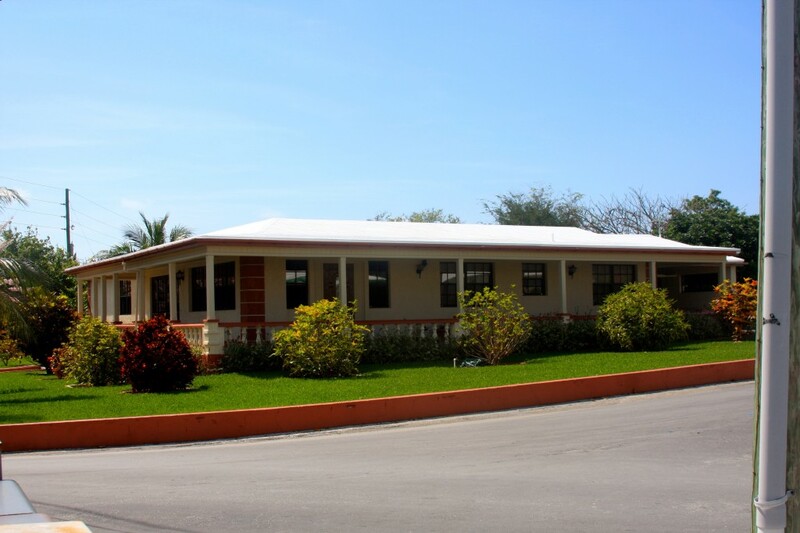 In fact, Spanish Wells exports more lobster than all of the other Bahamian islands combined. 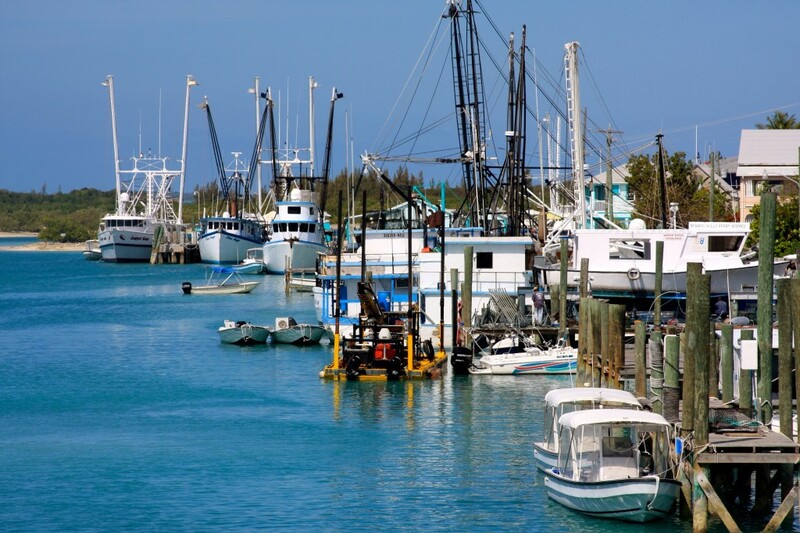 Lobster and shrimp seasons are over in the Bahamas so during the coming months the fishing vessels will be painted and repaired. There is very little tourism here, although it is a short water taxi ride to trendy Harbour Island. There are plans to build a Jack Nicholas designed golf course with luxury estates, a spa and resort, a marina, and upscale restaurants on nearby Royal Island, which is a popular place for cruisers to anchor in the protected bay before heading to the Abacos. The project has already begun and when completed will certainly give Harbour Island some competition but probably won’t affect Spanish Wells, which is a five minute boat ride away. A number of Americans, Canadians, and Europeans own homes in Spanish Wells and spend the winters here with some becoming permanent residents. 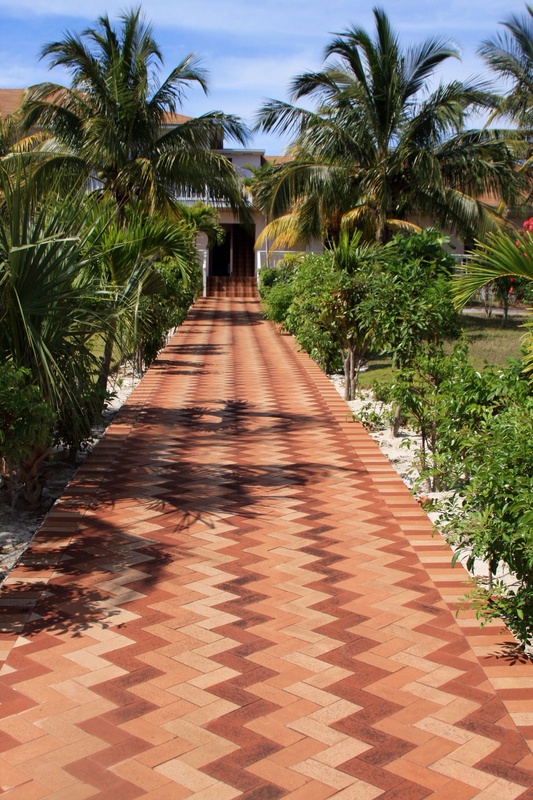 The homes range from small cottages to large estates and all are very well kept, most with beautifully landscaped yards. The roads are paved and the town is very clean. It’s obvious that the town is prosperous and there seems to be plenty of work for the residents. Unlike many of the Exuma islands, it is rare to find buildings that have been started and abandoned when the money ran out. There are construction crews working around the town building new homes and the craftsmanship is outstanding. 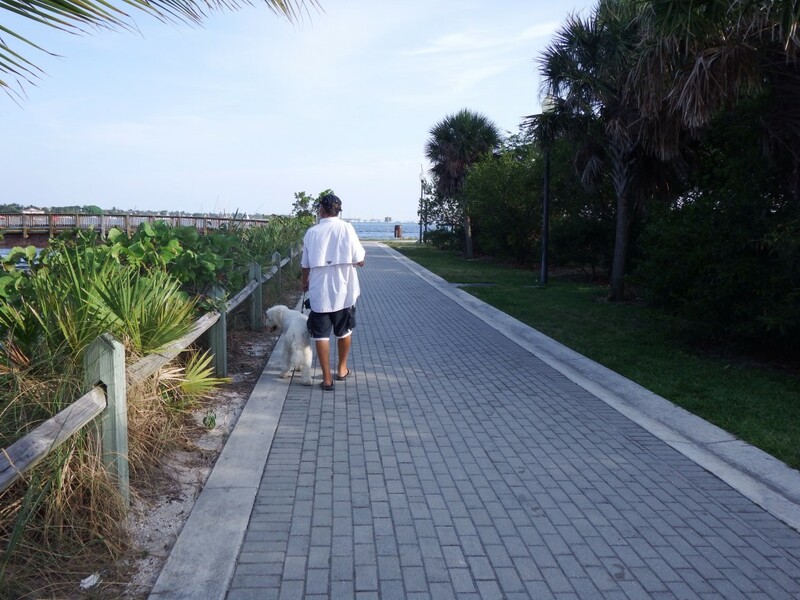 In between many of the houses in Spanish Wells there are sandy paths to the 2 1/2 mile long ocean beach and there are also several parks on the beach. At low tide it is a long walk out to water and then it remains shallow, a perfect beach for fetching a wubba. Along the mostly commercial road by the harbor, called South Street, there are marine and hardware supply stores, golf cart and car rentals, gift shops, an excellent seafood market, restaurants and take-aways (takeouts), a customs and immigration office, a small grocery store and even a boat lift where the commercial fishing vessels and pleasure boats are cleaned, painted and repaired. In 2010 we had our boat hauled out and the bottom painted here. It’s not unusual to see boats on the lift from Florida and other US cities. In other parts of town there are more businesses, most located on Main Street which runs parallel to South Street, including a dive shop, several clothing stores, restaurants, churches, coffee shops, a Batelco office, a bank, an auto shop, a government clinic, a computer store, bakeries, a dentist, a canvas shop, hair salons, a homemade ice cream shop, a law office, an appliance store, a realtor, a cemetery, a small museum, and a large IGA type grocery store. 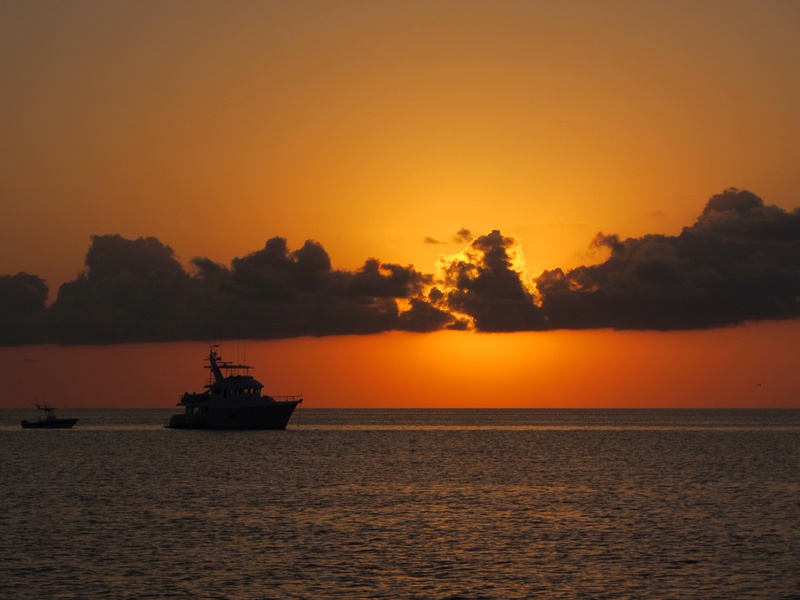 There are small ferry boats that take passengers to Eleuthera and Harbour Island and also a large “fast ferry” catamaran that makes the trip back and forth to Harbour Island once a day from Nassau with a stop in Spanish Wells. There are nearby reefs for diving and snorkeling and the harbor is perfect for kayaking. 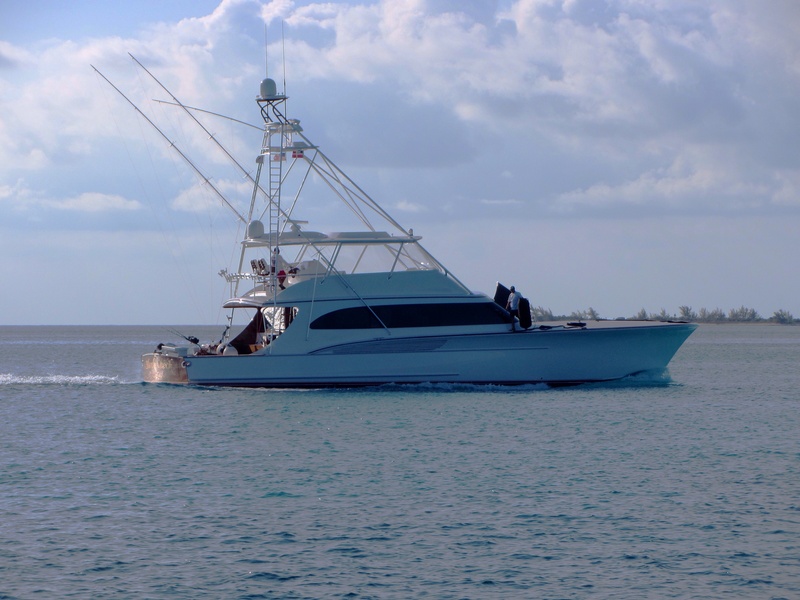 While we don’t fish, this is an excellent area for sports fishing on the ocean with world class bone fishing on the flats around Spanish Wells. The well protected mooring field where we are staying is a few boat lengths away from the docks along the harbor road and only has eight balls. There is also a marina, Spanish Wells Yacht Haven, that is currently doing major renovations with several brand new buildings. Below are photos of the mooring field and a small section of South Street across from us where the fishing boats dock and some of the commercial stores are located. 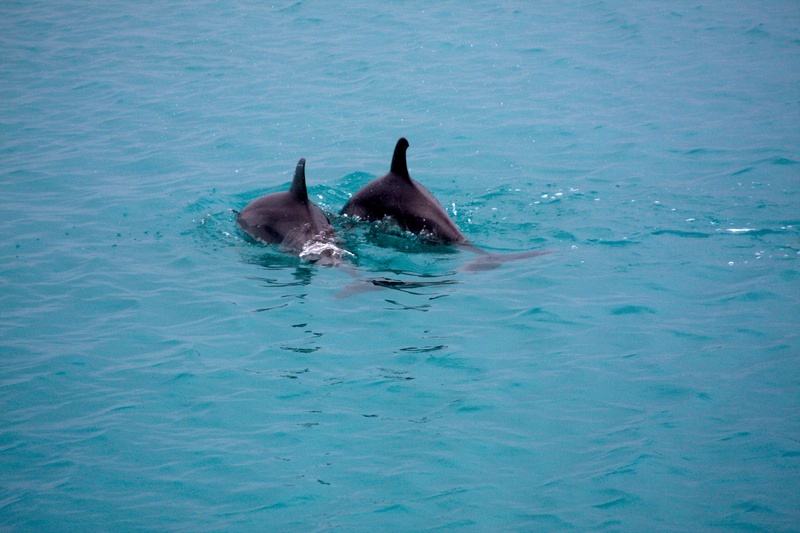 The mooring field is home to a family of dolphins who come by frequently to entertain us. As always, it’s impossible not to run out on deck when we hear them splashing in the water. It might sound like I have just described a large thriving metropolis, but Spanish Wells is a small town with very friendly people. 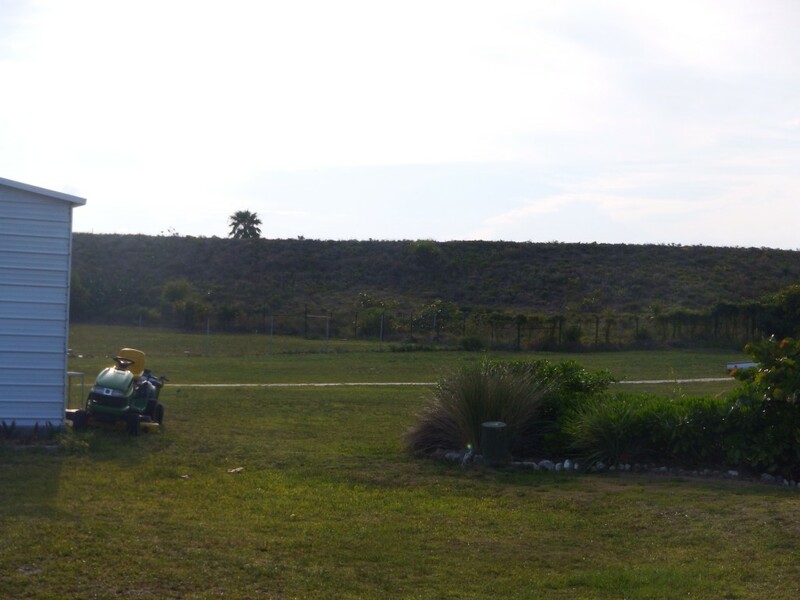 Most houses have a golf cart in the driveway as well as a car and the golf carts probably get more use. The grocery store is the largest we have seen since Nassau and it is well stocked with everything we need. Most of the other stores are small although very well supplied. There is a liquor store here but no bars. We have heard that the residents do not lock their doors and that crime is nonexistent. Perhaps that is the reason the police car is a golf cart. 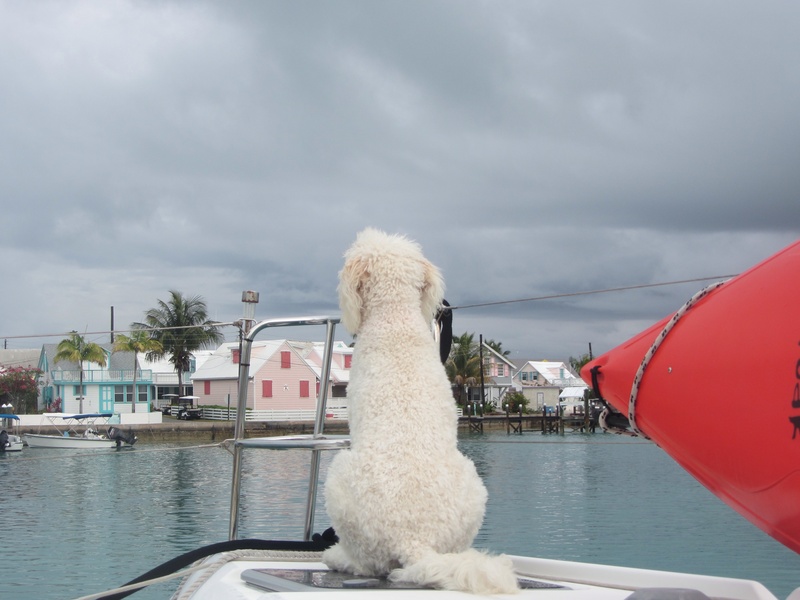 In the past we rode our bikes around Spanish Wells, but this year we are hesitant to leave Sailor alone on the boat while not at a dock, so he comes everywhere with us. We decided to rent a golf cart for the time we are here and are finding it very useful for getting around town. 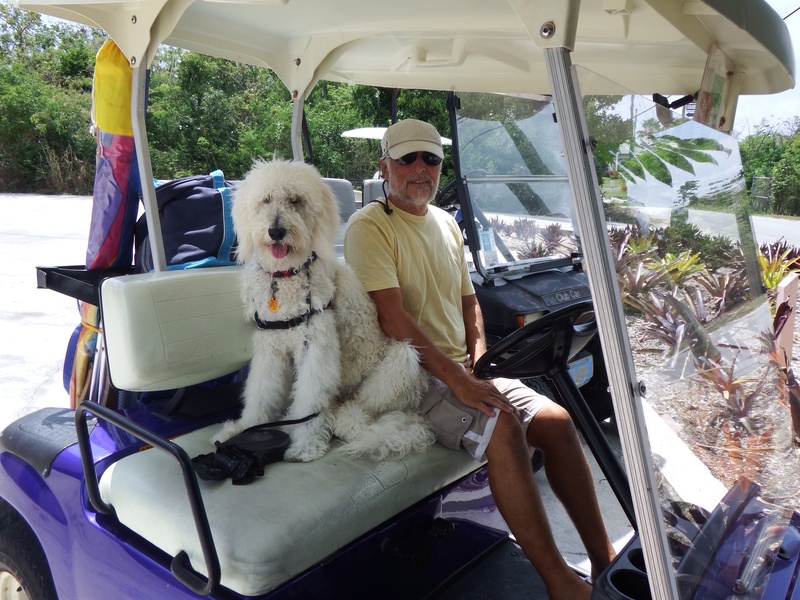 The nicest beach area is too far to walk with Sailor, and he has discovered that while he doesn’t like riding in cars very much, he LOVES golf carts. After racing up and down the beach fetching his wubba, Sailor is ready to relax for awhile while we read in the shade of our beach umbrella. Another advantage of having the golf cart is we can bring chairs, an umbrella and other items to the beach. 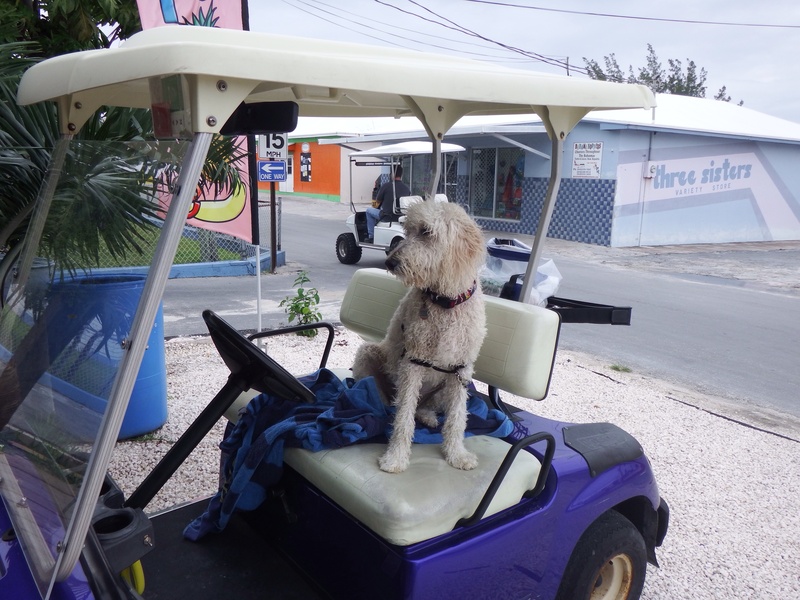 Driving on the paved streets is very easy and we return friendly waves to all of the cars and golf carts we meet. We were pleasantly surprised to find that there are three dog groomers in Spanish Wells. Sailor desperately needed a haircut, as can be seen in the two photos above, so a few days ago we took him to one of them and he got a nice summer cut. Of course one creature comfort I have been missing is Starbucks. Several coffee shops here sell their version of frappuccinos, and I must admit they are very close to what I’ve had at Starbucks. 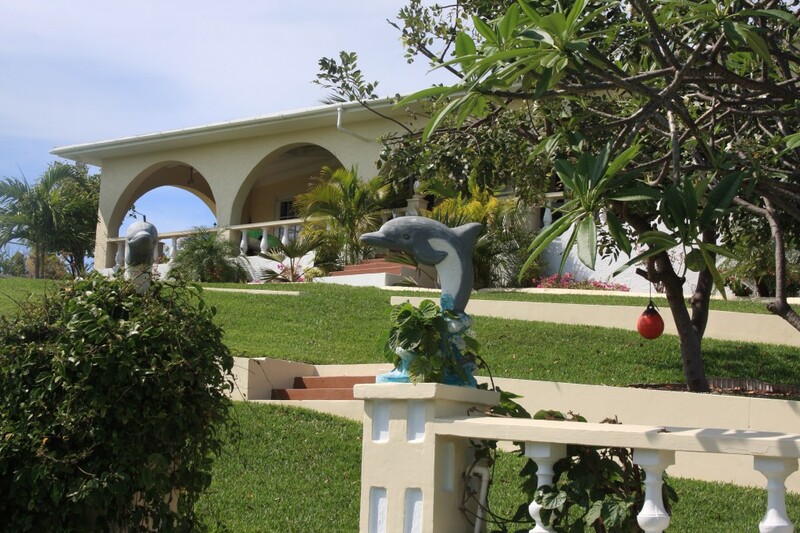 Spanish Wells seems to be a perfect blend of tropical living without giving up too many creature comforts. It is a great transition to ease us back into life in Florida. In good weather it is a three day sail from here to Lake Worth. However, we still have the rest of May to enjoy the Bahamas. 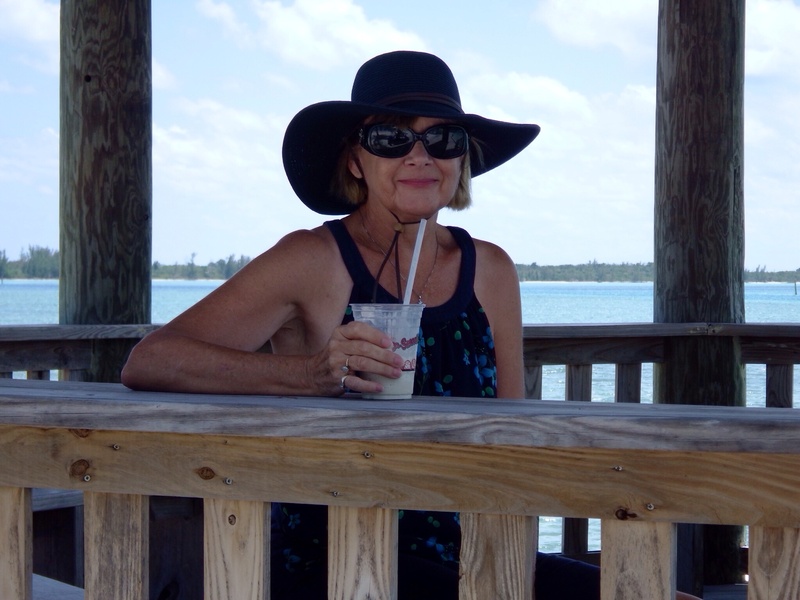 This entry was posted in 2013 - 2014 Bahamas Cruise, Bahamas, Spanish Wells on May 6, 2014 by Jan.